In the Bible, Moses sang. Miriam sang. So did Deborah, David, Mary, Paul, the angels, and so many more. The Israelites went to war singing; they sang over victories, over happy moments and hard moments. They knew something we've lost sight of: When we learn to sing God's words back to Him, we align the deepest spaces of our hearts with the deepest places of His--and we experience breakthrough. So why do we relegate singing the Word to just worship teams? Julie Meyer, a Dove-nominated artist and worship leader, has been teaching all believers how to do just this. She shows that you don't need to know how to read music or even sing in tune. All you need is Scripture and a willingness to engage God in song. As you do, you will see heartache turn into hope, despair into destiny, fear into fearlessness. You stand on the Word, pray it, and even memorize it. Now it's time to sing it. 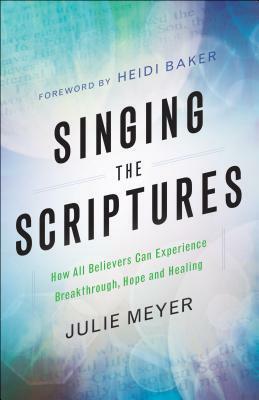 Singing the Scriptures by Julie Meyer is a great book about learning how to sing the scriptures. I love the idea of praising and worshipping God this way. This book was amazingly, interesting. As someone who prays scriptures, I loved singing scriptures even though I don't like how I sound, it has made it easier for me to memorize them. Singing the scriptures has made it easier for me to remember them. Julie's methods are very easy and doable for anyone. The idea is that you sing, create a tune and use the scriptures to sing. It is that easy. She also has suggested prayer, questions to answer and video links for further instruction in the chapters. I think this book is fantastic. I give this book 4/5 stars. A favorable review was not required for a complimentary copy of this book.